Seattle Timezone - What timezone is Washington State? Which timezone is Seattle in? 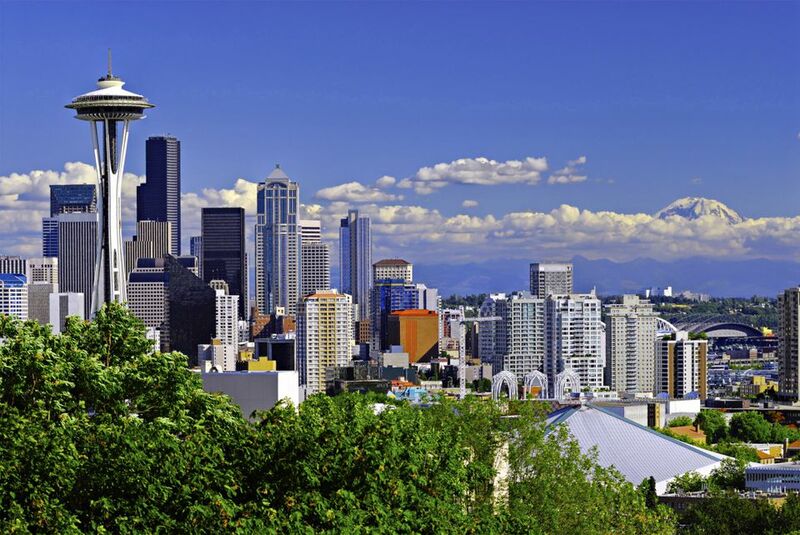 The short answer is that the Emerald City is in the Pacific Time Zone, but for some more facts about which other area cities are in the Pacific Time Zone with Seattle and other time zone trivia, read on! Which other Northwest cities are on Pacific Time? While some states have a timezone divide within their borders, all of Washington State is in the Pacific Time Zone, as are Oregon and California. This means that all major Northwest cities, including Tacoma, Olympia, Bellingham and Portland, Oregon, as well as Eastern Washington cities like Spokane, are in the Pacific Time Zone too. Northern Idaho and Nevada are also on Pacific Time, so you can travel pretty far and wide in Western states without having to deal with a time change. What time is it in Seattle right now? Where did time zones even come from? Up until 1883, most local cities and regions throughout the U.S. set their own time by the sun, but after railroads began crisscrossing the nation and carrying people hundreds of miles within a single day, this system of local time became a problem. It became impossible to keep schedules or for passengers to know when to show up for their train with this system. In 1883, the U.S. switched to having four standard time zones to solve the issue. How does the Pacific Time Zone fit into the global scheme of things? The Pacific Time Zone is eight hours behind Coordinated Universal Time, which you’ll see notated as UTC-8. There are a total of 40 time zones in the world. There are four time zones in the United States: Pacific, Mountain, Central and Eastern. There is a one-hour difference between Washington State and cities located in the Mountain Time Zone, a two-hour difference to the Central Time Zone, and a three-hour difference to the Eastern Time Zone. The Pacific Time Zone is the westernmost time zone in the United States, meaning it's the last to see the sunrise and sunset each day. Since we're three hours behind the East Coast, time also often works out well for live broadcasts from the East - we get to watch earlier in the evenings than they do. The exception is Saturday Night Live - this is broadcast at 11:30 p.m. just like it is on the East Coast so West Coasters see it on a delay. If you're not so great at figuring out the time difference between where you are and where someone else is, there are tools online to help, such as this one called the Time Zone Converter. Alaska also observes the same time as the Pacific Time Zone, but does not call the time zone by the same name. Instead, the state uses Alaska Daylight Time. Washington State does observe daylight saving time. During daylight saving time, Washington State’s clocks are set forward one hour, which then makes us UTC-7 (or only seven hours behind Coordinated Universal Time). Daylight saving time happens on different dates each year, but always starts the second Sunday in March (clocks forward one hour) until the first Sunday in November (clocks backward one hour). In the U.S., clocks are normally officially changed at 2 a.m. on Sunday morning. Some states, like Arizona and Hawaii, do not do daylight saving time. So if you're in a time zone that does - as you are in Seattle - then you have to account for the difference, depending on the time of year. During times when Washington is on standard time, Arizona is one hour ahead of us. During times when we're on Pacific time, Arizona and Washington have the same time. Daylight saving time goes from approximately mid-March to mid-November.